The KONG Cat - Tropics Teaser Fish is the ideal cat toy for stimulating your cat's playful instincts! 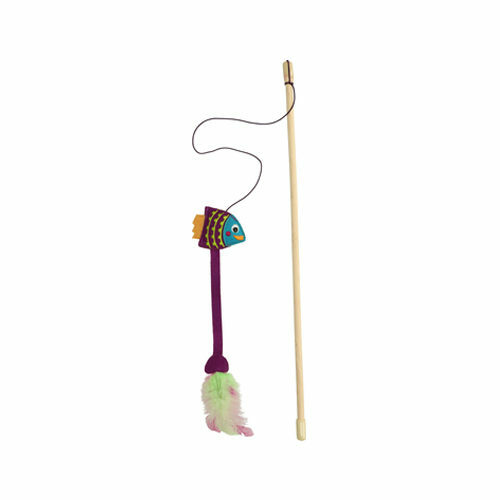 The toy fishing rod is made from a wool material and contains catnip and fluttering feathers, so your cat is encouraged to grab the toy. Toy fishing rods, such as the Tropics Teaser Fish from KONG, are ideal toys for stimulating your cat's playful instincts! This cool toy is made from a wool material. What's more, this toy contains feathers that will lightly flutter in the air and a healthy dose of catnip. Lots of fun guaranteed! Have you used KONG Cat - Tropics Teaser Fish before? Let us know what you think about this product.